Probably English, stag horn scales on a pistol knife. This is a rare and unusual item. It is from the Bob Nugent Collection and I am selling it only because I can not own it in Canada without it being destroyed by our law enforcement agencies. 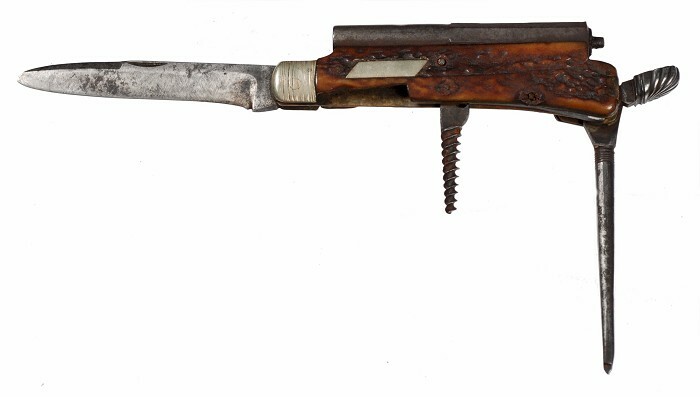 It is a wonderful piece that was made for a time when such pistols were spiked (see the spike folded out of the bottom) into the four poster bedpost, ready to be fired on an intruder. It has a large blade that locks as a switchblade would and can also be used as a defense item. The barrel is on top and the corkscrew is its trigger - it takes a .22 bullet (I am not an expert here). The piece is located in the U.S. and will be shipped from there. Shipping is extra and the cost depends on the destination. Shipping will be by the Canadian Post office and insurance is available from Canada Post. Uninsured parcels are at the buyer's risk if lost. Other shipping methods are possible if you specify it (FedEx, UPS, etc.). Please wait for the invoice before paying. PayPal is accepted as well as USD checks.